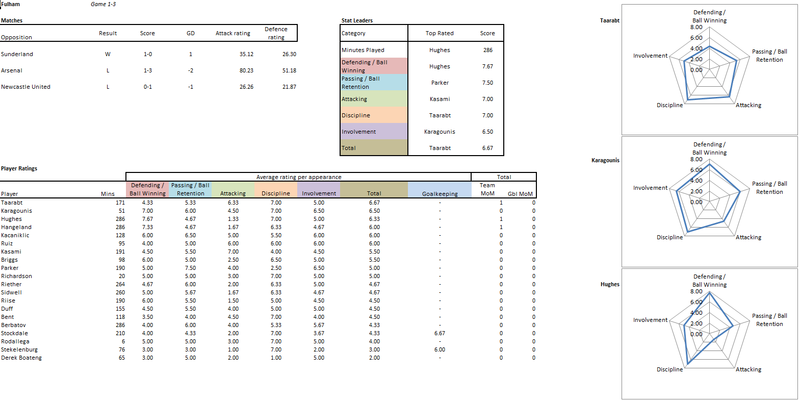 I maintain a database of EPL players, using it to calculate ratings and performance stats for every player in the league. 3 games in, the starting line-ups are barely settled and the small sample of matches leaves a lot to chance. 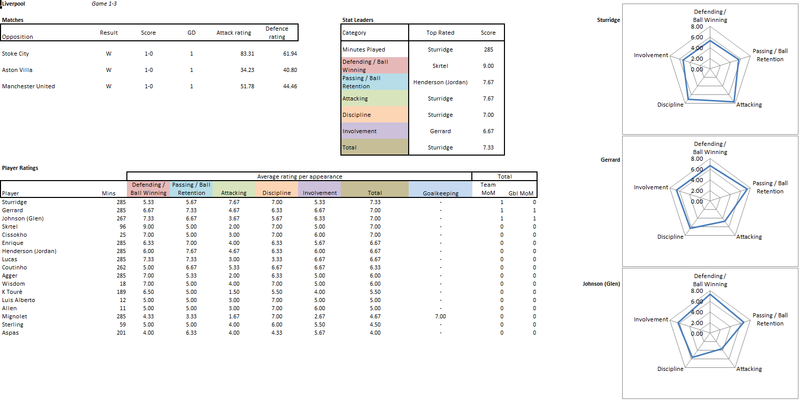 Nevertheless I’m publishing some data to try out a new reporting format and develop a ‘quick to print’ process. Some of the key players that will influence the league may have already begun to show their quality in the ratings. Earlier this year I categorised 6 ‘themes’ by which to rate players – some of which have little correlation to team results but nevertheless give some degree of insight into what type of player an individual is relative to his peers. They’re pretty self-explanatory really but I will note that success rates of performing certain actions are accounted for in the ratings. 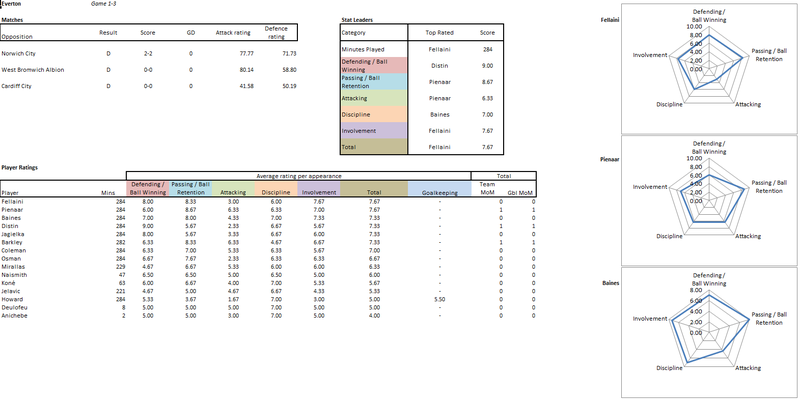 And I’ve decided to rank them 1-10 to make them as intuitive as possible (and equivalent to ratings on Football Manager / whoscored / etc). Walcott & Giroud most influential early on, with Ramsey enjoying high involvement and passing stats as he has assumed some of the missing Arteta’s responsibilities. No surprise to see Benteke leading the stats. Delph continues to be highly influential as well. 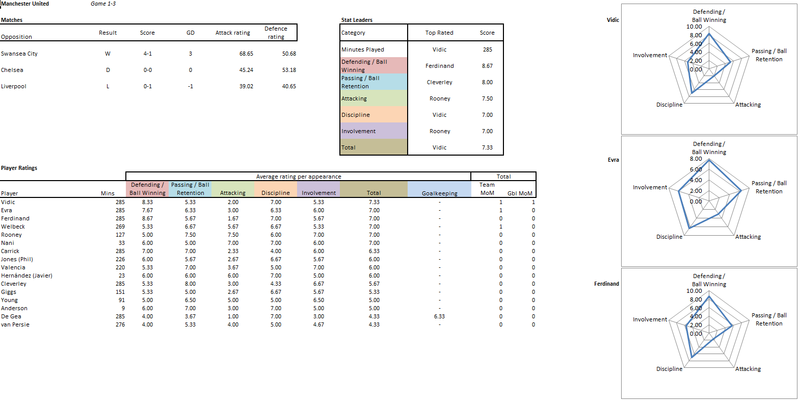 Some low-ish scores for Cardiff players, partly reflecting the mixed bag of results they have had so far. Chelsea’s stats show Hazard and Oscar vying for top player. O’Keefe sits at the top having enjoyed a goal in his only brief appearance against Sunderland. Defensive-minded players Jedinak, Ward and Delaney have excellent early defence ratings. Not many minutes being shared to those outside the first 11 as yet, although with Fellaini out the door and some new arrivals in the team it will be interesting to see who becomes the most dominant player – my early money is on Pienaar. 20 players already have game time for Fulham which indicates how much competition for places there is. Little to shout about stats-wise. 2 subs lead the way, followed by Elmohamady, who has been adept at retaining possession so far. Sturridge, who else? On the other side of the coin, Aspas has underwhelmed the model so far. Silva & Clichy are involved a lot for City and it’s understandable, particularly as they retain the ball so well. It could also be an indication that Clichy has been identified by the opposition as a weak link so he has more defensive work to do than average. Vidic, Evra & Ferdinand at the top here which says much about the opposition United have played so far. 2 games of little service have left RVP’s stats lagging behind the rest. Santon has picked up this season from where he left off last year, leading the way in terms of performance on the field. So far so good for new signings Redmond and Fer, who have made a bright start to life at Norwich. It will be interesting to see how Snodgrass develops this year considering his high influence last season. Fonte and Lovren stand out so far from Southampton’s close games. Early days for Stoke under Hughes, but fans will be happy with 6pts in their first 3 games. Marc Wilson’s good all-round contributions make him stand ahead of the crowd. Interesting here as Roberge tops the chart, despite only playing in the first game of the season (and being criticised for making the mistake that allowed Fulham to score). Great stats from Chico again so far this year – those who caught my reviews of last season will already know how highly the model rated him. Despite the many millions spent on new signings, Townsend has been most influential for Spurs so far. But with Lamela and Eriksen yet to play a full game watch this space. Not a lot to shout about yet for goalless WBA. Joe Cole and James Collins lead the way but just 50mins of playing time from Ravel Morrison was enough to push him into 3rd place. This entry was posted in Football Analysis, Sport and tagged 2013-14, EPL, Player Ratings on September 14, 2013 by thepowerofeleven. I’m adding to the long list of articles reviewing the transfer dealings that have taken place this summer. I don’t have a lot to elaborate on some excellent pieces I read this week, so I’ll provide some links to them first and some charts after. This one, from @mixedknuts on Stats Bomb is an entertaining and well-reasoned leveller discussing Everton’s reportedly expensive loan signings – reminding us that spending big sums isn’t really a good strategy for teams that are subject to heavy budget constraints. This, from @altmandaniel throws a cold glass of water in the dreaming fan’s face to say that spending on attack isn’t everything – despite almost every team (except Cardiff?) having generally focused on goalscoring additions to their squads in the transfer window. And this, from @TheM_L_G on Grantland looks at Spurs’ squad evolution over recent years in light of their recent headline-grabbing dealings. There are no doubt several other pieces I haven’t read of a similar ilk but these are nice articles because I think they combine fairly well to give us a straightforward education in transfer spending and strategy – particularly useful to refer to when we are observe last-ditch transfer deadline madness where longer-term strategy appears to fly out of the window in favour of impulse. Anyway, on to the information I put together. I’ve consolidated some data on transfer spending in the EPL over time and taken a fresh look at spending vs points/goal difference. More than anything I suppose I wanted to put some things into context. Current season net spend is indeed bigger than any previous season (shown by the bubble sizes above), and we haven’t had the January transfer window yet – this shows how much the EPL has been looking abroad for talent this year and indicates the reluctance of EPL teams to sell to rivals (Suarez, Rooney and Baines are a case in point). 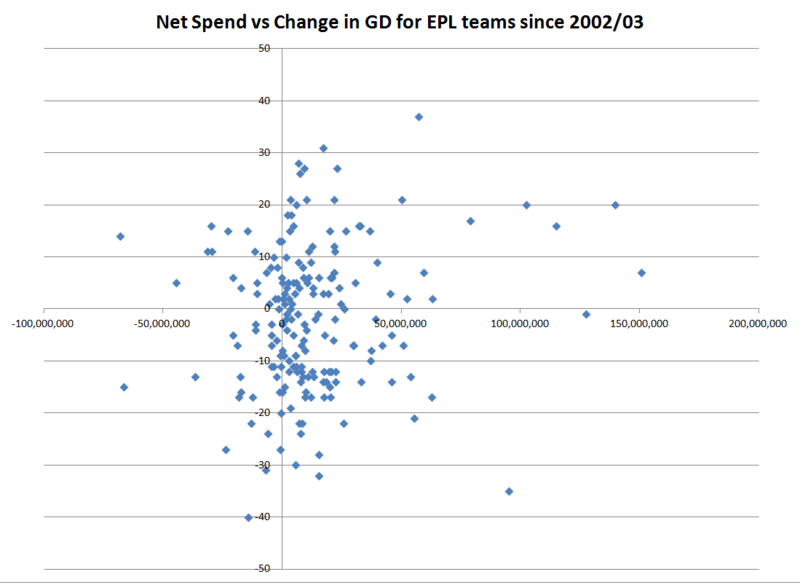 I suppose this graph shows again how much the EPL does like to subsidise its rival leagues! 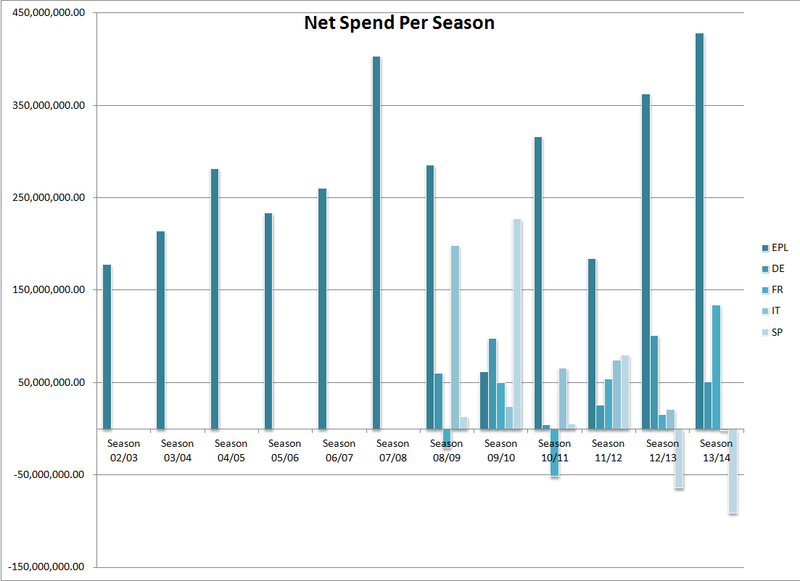 However, Spain actually eclipsed the EPL net spend once in the last 5yrs (09/10) all thanks to Ronaldo. As an aside, I don’t buy the English talent drain argument when it come to the national team but this does indicate how much the EPL loves an import. For the 2 charts above, I took the net spend of every club and compared their change in points total, and change in goal difference, against the previous season. 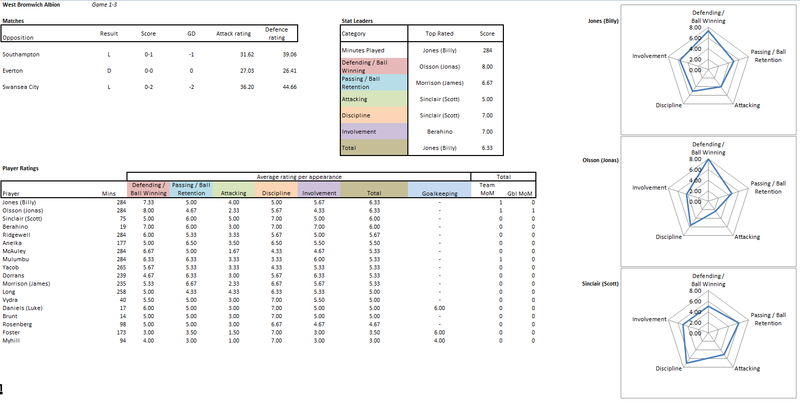 187 results since 2002/03 (excluding newly promoted teams). 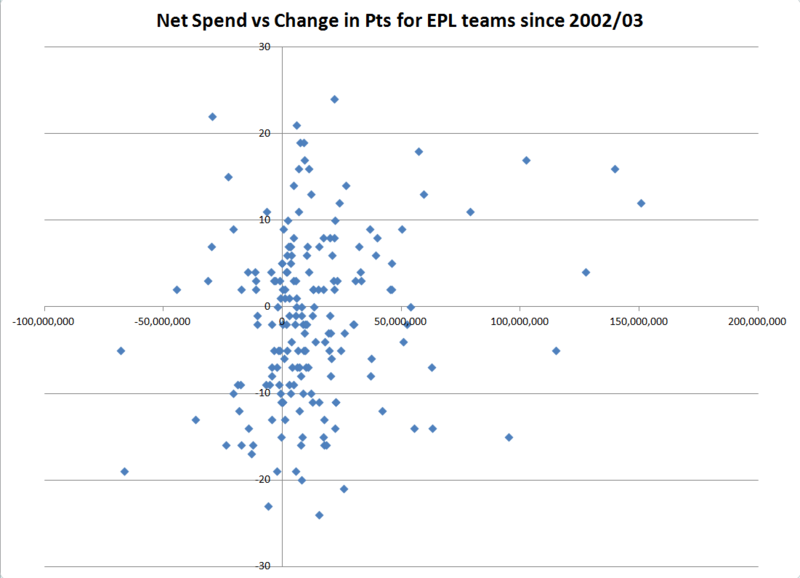 Others before me have done this and I have done it again – concluding that there’s basically no relationship here between net spend and a team’s resulting points growth. There are winners and losers yes, and certain examples buck the trend, but in general spending more money won’t buy you happiness (at least immediately anyway)! We do have some success stories here, although how much of the change in points totals can be attributed only to transfer dealings is quite contestable. 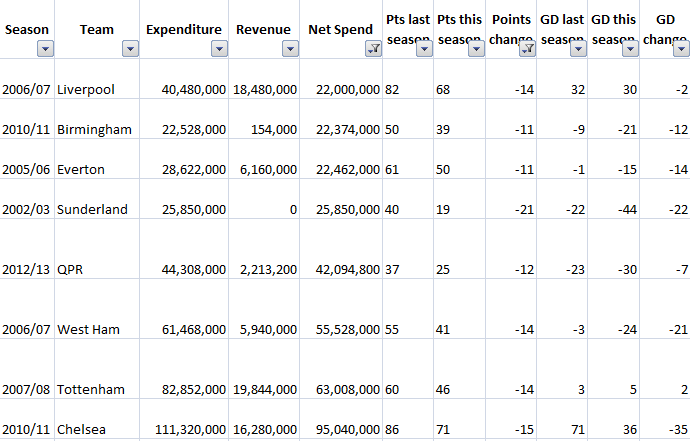 Above I listed teams whose net spend made them £20m+ better off and yet still increased their points total on the year before. Take a bow West Ham? Oh, wait, the following year their points total was down to 35 so perhaps not! Arsenal feature twice thanks to Wengerball. And now here are the teams whose net outlay was £20m+ but they still managed to end up more than 10pts worse off than the season before. 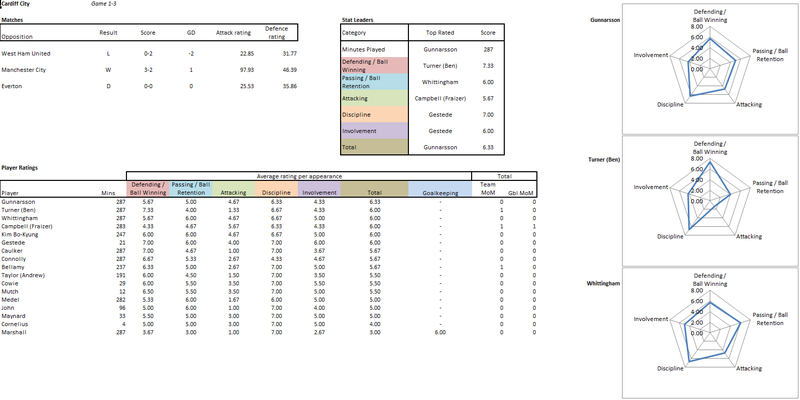 The West Ham example above suggests we could put an extra season lag on the changes and see what happens to the relationship – in many of the examples I just published, the teams may well have traded heavily in January thus making the opportunity for dealings to affect performance slightly lower in that season. But adding a season lag doesn’t make a difference, I checked. Take my word for it. So what I am saying here? I’m reiterating many before me but spending big doesn’t get you big improvement fast. Regime changes, as happened at Chelsea and Manchester City are sort of an exception, but they have enjoyed consistent high spending over numerous years to bring success. I wouldn’t even say that they’re better at picking star players, rather they have a better chance of buying star players simply because they are buying more of them. It’s high time the average EPL club wised up and changed their transfer approach because they’re really not that good at spending money. 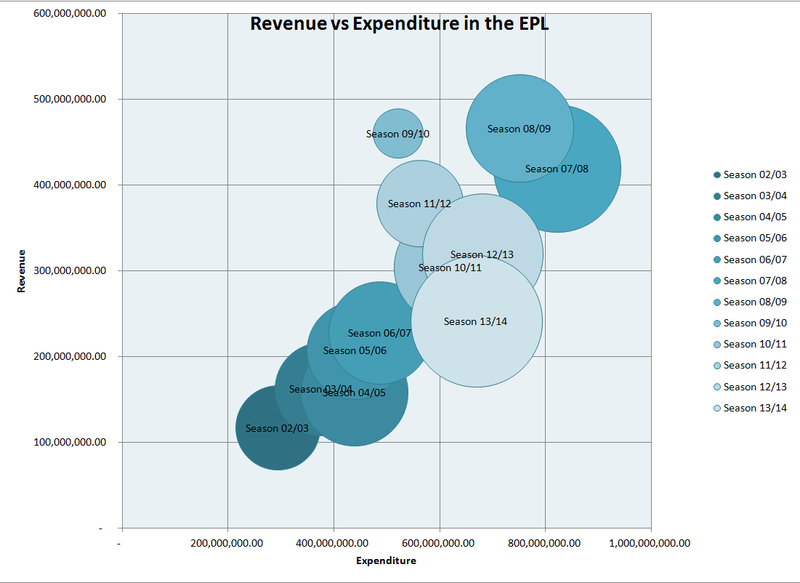 This entry was posted in Football Analysis, Sport and tagged EPL, Football, net spend, transfers on September 6, 2013 by thepowerofeleven.